Posh 5 Productions is your destination for premier event planning and program management. Whether you’re hosting a corporate or social event, we’re here to take care of the details so you won’t have to! 1. Our goal is to evoke all 5 senses, ensuring that attendees remember your event for years to come. We at PO5H like to approach the event planning process with the idea that guests should not just attend an event, but experience it. We’ll set the tone from start to finish, creating a look and feel that will have your guests talking about the event before they arrive and long after they’ve departed. 2. We’re a boutique company, which means you’ll receive personalized attention, ensuring every detail is tailored to your event. From the rentals to the lighting, from the catering to the entertainment, we’ll walk through every step of the planning process with you to ensure that each and every detail not only meets your expectations, but exceeds them. 3. 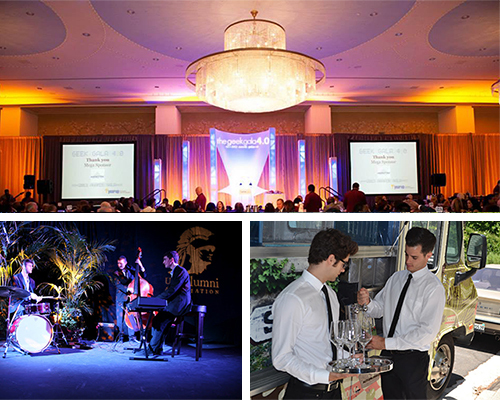 We want every aspect of your event to be flawless – and we’re not just talking aesthetics. Our team is experienced in program management and is happy to assist you with developing and implementing creative ways to make your event stand out. Whether you’re having a corporate affair or private party, we’ll make sure that your guests leave with a clear understanding of the goal behind your event – whether it be to raise funds for a charity, or simply to celebrate a momentous occasion! 4. We understand that some events require “a little something extra.” Need to make special arrangements for a few VIP guests? Looking for one-of-a-kind perks and incentives to “wow” the crowd or seal the deal with potential investors? Let us know what we can do to take your event to the next level. 5. Last but certainly not least, we wouldn’t be “posh” if we didn’t know what it means to put on a classy affair! Simply stated, our team is dedicated to bringing you superior event planning services, flawlessly executed with a finesse that speaks for itself. I am a graduate of the University of Southern California and have over a decade of experience in the event planning industry, having worked with such companies as the University of Southern California, Constellation Brands, and Sundance Institute, to name a few. I established Posh 5 Productions with the idea of putting on events that create memorable and meaningful experiences for all involved. My passion is in transforming a simple vision, making it a reality, exceeding expectations and leaving guests in awe. The details aren't just found in the lighting, décor or placement of tables and chairs – they're in the feelings evoked from the music played during a gala; the inspiration that comes from a keynote speaker's story at a fundraiser; and even the recognition of a company or brand by a guest who walks away with a fun, uniquely branded giveaway. For me, events aren't just about the few hours that someone is in attendance, but about the experience as a whole. It's about creating memories that will leave people talking long after the event has ended. Check out our services page to see what PO5H can do for your next special event. I look forward to working with you! Posh 5 Productions is a boutique event planning and program management company based in Los Angeles, CA.